The heavily favored Washington Capitals have faced an opponent in the Toronto Maple Leafs that many predicted would be eliminated with ease by a D.C hockey club that has played some of its best hockey in franchise history. Three games into this series, the Maple Leafs have surprised hockey fans and audiences everywhere. 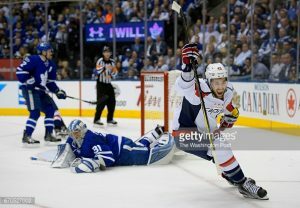 Their ability to challenge the Presidents Trophy-winning Capitals with nifty goaltending from Frederic Andersen and a potent offense led by Toronto’s premium young talent has abruptly disturbed Caps fans everywhere. Heading into a pivotal Game 4 in the rambunctious Air Canada Center full of passionate hockey-mad Ontario citizens, the Capitals needed to be at their best to quiet the chaos. Two quick goals from the sticks of TJ Oshie off a rebound and a laser slap shot from the hashmarks by Alex Ovechkin steered momentum in favor of the visitors, at least for a little bit. The puck luck for the Maple Leafs would continue to frustrate Washington as Zach Hyman deflected a pass from the point past Braden Holtby and resurrected the Toronto faithful. At this moment, Caps fans felt a familiar “here we go again” feeling and braced for another blown lead that has eviscerated significant games in recent past. But it would be two quick goals from an unexpected hero in Tom Wilson that allowed Caps fans to exhale heading into the first intermission. Toronto would score first in the second stanza off yet another lucky bounce to cut Washington’s lead into two, courteous of James van Riemsdyk. The rest of the period would remain scoreless but at the end the Capitals started to play with fire. After a slashing penalty from Brooks Orpik, the Capitals faced a difficult 5-on-3 penalty kill heading into the third period. The Capitals would be successful in killing the penalty and gave them much needed momentum any road team strives to obtain. That momentum would be strained after Auston Matthews buried the puck into the net off yet another lucky bounce. Less than a minute later however TJ Oshie would find himself a narrow lane of ice heading right toward Andersonn and made no mistake in striking the back of the net with a gorgeously executed five-hole goal. The crucial insurance goal would make the contest 5-3 in favor of Washington and it would be up to the defense and Braden Holtby to stand tall and close this game out. The Capitals resilience would be tested again when Tyler Bozak notched a late goal with 27 seconds left in the final period, but it wouldn’t be enough as Washington fought and tied the series heading back to D.C. Many have been surprised so far on how competitive and difficult the Maple Leafs have been to the heavily favored Capitals. As Game 5 approaches, fans should expect this to be a long series and extend to seven games. In recent years most Game 7s on home ice have not treated the Capitals favorably. Even though this is a different team since those last season-ending disappointments, you really can’t blame any Caps fans for worrying if history will repeat itself.